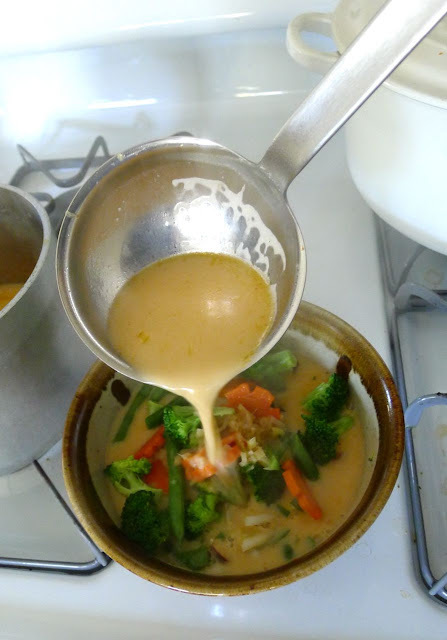 If you'd like a vegan version of this soup, go to this post. I was supposed to go out with friends for dinner the other night but I called them and told them I was sick and shouldn't go out. About an hour later, they showed up at the door with some Tom Ka soup from the Thai place in Harvard Square. Isn't that sweet? It helped my sore throat and I really felt like it was really restorative so I thought I would make a batch of my own so I could have it again. This isn't vegetarian but I did find recipes online for it. I think you could just use vegetable stock and leave out the fish sauce. You could also add chicken which is called Tom Ka Gai. These are the vegetables I used for my bowl of soup. I was feeling like (lucky) sevens would be good for me so I used 7 pea pods, 7 green beans, 7 pieces of raw zucchini, 7 slices of onion, 7 pieces of baby corn, 4 cremini mushrooms (cut into 7 slices), a few broccoli florets, 7 slivers of ginger root, 7 carrot flowers, and some cilantro leaves. 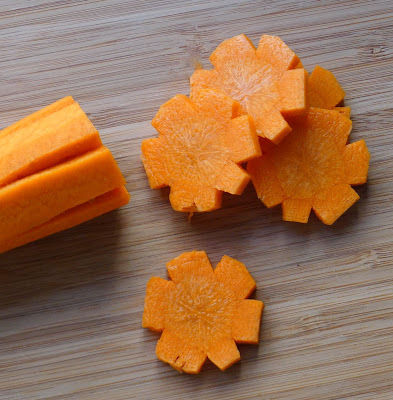 To make carrot flowers, just cut several V grooves down the length of a carrot and then cut slices. How could carrot flowers NOT instantly make you feel better? 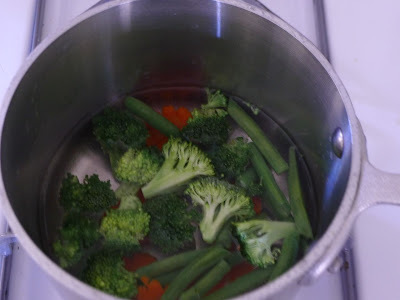 ...but I blanched the brocolli, green beans and carrots for two minutes to soften them. 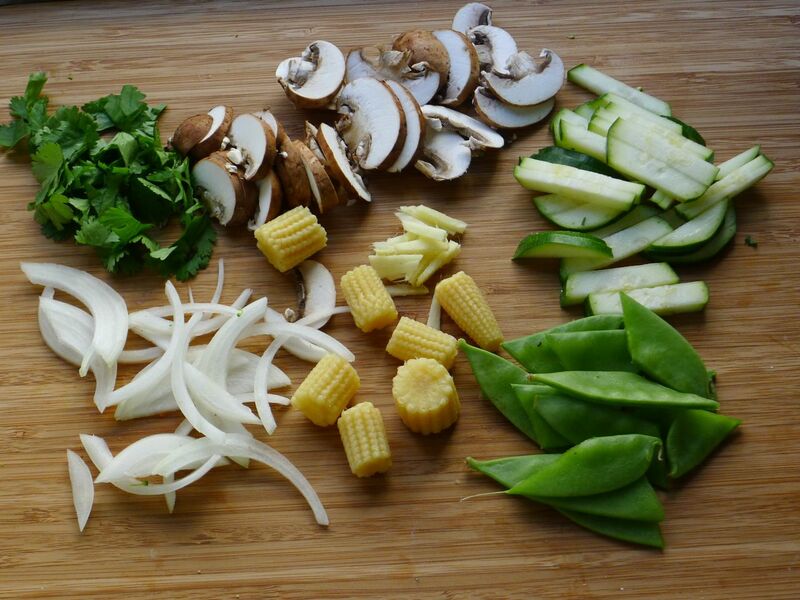 Assemble all of the veggies in a bowl, ladle on the broth and top with a few extra cilantro leaves. Piping hot Tom Ka Vegetable Soup. It's good for what ails you. That looks delicious Steve! We all have strep throat around here so I'm going to give it a try since you must be feeling better. Soup is my favorite ... I'm always looking for good new recipes. And, I am so excited to make the carrot flowers! 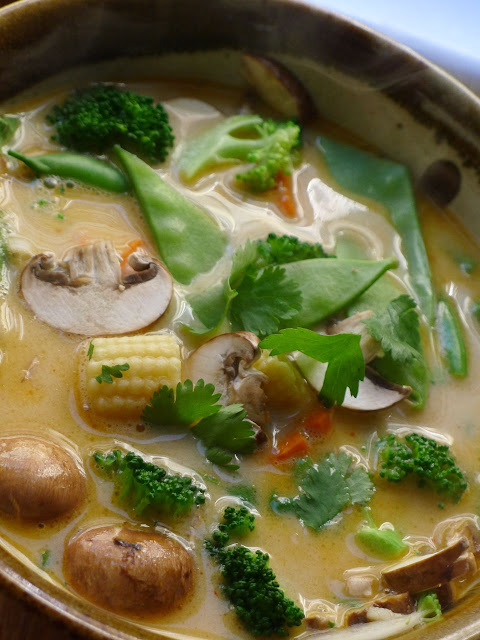 We are going to love this soup. I can almost smell the ginger. Great recipe Steve. YUM! That looks so darn good! Beautiful photos too. I love the carrot flowers. So cute! Yum!! What nice friends to nurture you with this yummy soup! It's on my radar to cook on my new stove! Oh that looks so lovely...I must try that sometime. You are a very neat cook...loving the veggies lined up and pretty carrots. Mmmm. I had my first bowl of Tom Ka Gai when we moved to the Bay Area, but haven't had it since. This is totally the perfect sick soup. Do I remember that it was spicy? I would never, ever think to make it from scratch, but this looks pretty easy. It's not usually spicy but some of the recipes called for Thai chiles so I went to a big squirt of sriracha and it was great! Did I know you could cook? I knew you baked. You're right about virtual soup. It looks and tastes delicious. And spicy. Yum. This is my most favorite soup of all time. A must every time I go to the Thai Restaurant. Darn...now I want to go get some take out right now. I like tofu in mine. I didn't know it had chicken stock in it. I guess I should have assumed. I thought I was eating all vegetarian when I ate it. Poo. I need to make this at home. My cousin, Shelly and I are mad for Thai. It's our absolute favorite. We never tire of it. She is my Thai Buffet eating buddy and with her being sick. We rarely get to do it any more. Thanks for the recipe! I am making this tomorrow! I love all your photos, but you had me at carrot flowers...how have I never done this before? Is it something you grew up with? I was just wondering. I had to pin your carrot flowers to my "Fun Food/drink" Board! oh i love this soup. i order it at our favorite thai place with tofu. they call it tom ka tofu. it is delicious! i'm so impressed with your knife skills. i may just have to try this. your fake egg salad is still my favorite. this looks delicious. I am going to have to try this. What great friends! Love the carrot flowers! hope you are feeling better Steve! I love soup and this looks and sounds wonderful. I must say though, I've never in my life had only 7 pieces of cilantro;)... maybe 7 per bite! what a beautiful soup! Tell you what, any time somebody shows up at my door with food I always feel better. Oh I will have to order that~I have never had it before (and I lived in Thailand for 3 years as a kid)! The soup looks delicious. You sure are a neat cook. Carrot flowers! Who knew? The order in your life leaves me a tad breathless with envy particularly your delightful vignette of veges. Your images sent me rushing to the grocer for tomorrow night's dinner. Looks delicious and your presentation is gorgeous! I have a ton of oyster sauce left but no fish sauce. I wonder if I could use that instead. Nourishing, tasty, and bites of pure health! By the way...WTH is Tom Ka anyway...I must live a sheltered life.....poor me. Oh my.... Yum! I have a ton of lemongrass I need to use before the first frost. Sounds like the perfect venue. Tom Ka is my all time favorite. 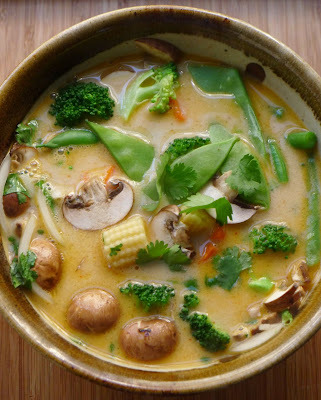 You veggie version looks super healthy (and good for my diet.) And I must say the most beautiful soup photo I've seen. :) Hope you're feeling better. 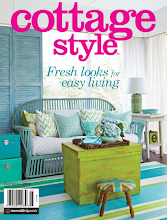 I can't decide if you should be a decorator, a photographer or a cook. Hmmm. Anyway, that looks incredible and is a must-try for me. Can't believe you're still not feeling well. Hope tomorrow is better! OMG! You even make SOUP look stylish and perfect! Oh....ELISH! with a capital D! Oh yum yum yum! My mouth is watering just looking at it! It's the perfect winter dish! 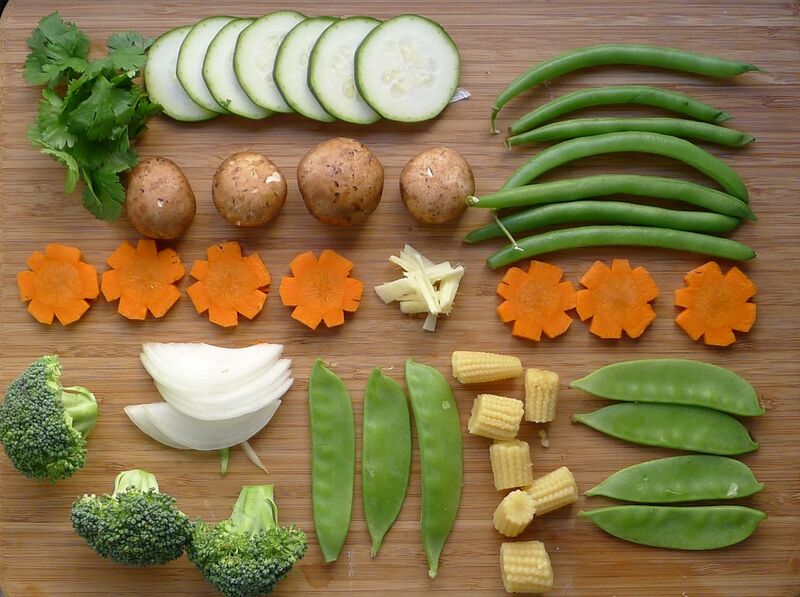 OK...I looks really good...but I'm so very concerned for you...did you actually count out the number of veggies and arrange them as a piece of art for that photo and then cut those carrots into flowers...I don't know whether to be impressed or suggest you seek professional help! I love that you took the time to make carrot flowers - and to take photos with your left hand just for little old us! I have to say it looks delicious. I have used several recipes trying to match the restaurant quality that I crave, and they always come out tasting a little crazy. I can't wait to try this version, because it seems so simple and the pictures look spot on to what you find in a restaurant - thanks! I love that you posted this! This is mu husband's favorite soup. If I can somehow manage to pull this off, I think I'll just have to win the wife of the year award. :) Wow, this looks delicious. Well done! I love this soup...thanks for the recipe. Those carrot flowers are so cute. We took our kids to Thailand a while ago and watching the chefs carve fruits and vegetables was one of their favorite memories. I made this for my mom and brother tonight, following your recipe! Oh my - that looks incredibly delish!! Have to make your recipe - thanks for sharing it. i made it twice and it was amazing! Came out great, doubled the recipe as the cold season approaches to freeze for when I have the sniffles. I made pad thai earlier so I had all the ingredients already. Fast to make, cheap to buy and delicious! Looks pretty great - I haven't seen that before at a thai restaurant, so I may have to ask next time I'm at one. Pho is my favorite, but I always like trying something new. ive had this at a restaurant, so yummy. thanks! Made this today and it was AMAZING! Thank you for sharing! The only thing I can think of that is missing from the soup is bay leaf. I always pick it out before I eat my soup, other than that can't wait to try this resipe out. Been making many drives to my favorite Thai spot for this soup everytime I have a hint of the sniffles. I have never had fish sauce. Doesn't even sound good. What exactly is it and is it necessary? Looks great! How many servings? I make this all the time. your recipe rocks! I just made a double batch of this soup for the first time, and it's SOOOOOO good! Thanks for the recipe! Kha is galangal, not ginger. Otherwise, this recipe sounds good!! And the carrot flowers are too cute!! 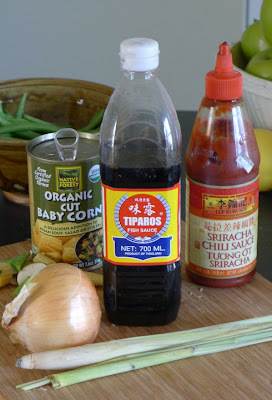 And for the few commenters that have asked about fish sauce, it's made from anchovy, salt, and water. It provides the umami flavor to the soup. I would never substitute for it, but you could swap out soy or tamari sauce. Just make sure you taste as you season. Also, another person commented that the soup is missing bay leaves. Bay is not used in Thai cooking. Perhaps they confused kaffir leaf for bay? I agree about the galangal but I thought most people would have a tough time finding it so I used ginger to make it more accessible. I think you're right about the kaffir/bay confusion. I made this soup today and it was way too sour for me and I only uses one lime. Hi. This might sound like a silly question. But I love soup and see so many recipes using coconut milk. I am afraid to try them because the idea of a sweet soup turns me off. Does the coconut milk make it sweet?? This was excellent. I only used juice from 1/2 lime and 1 tsp sriracha and it was sooo good!! Thank you for a wonderful recipe!! 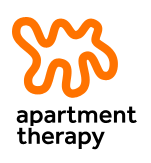 Apartment Therapy - Flattery or Stealing?